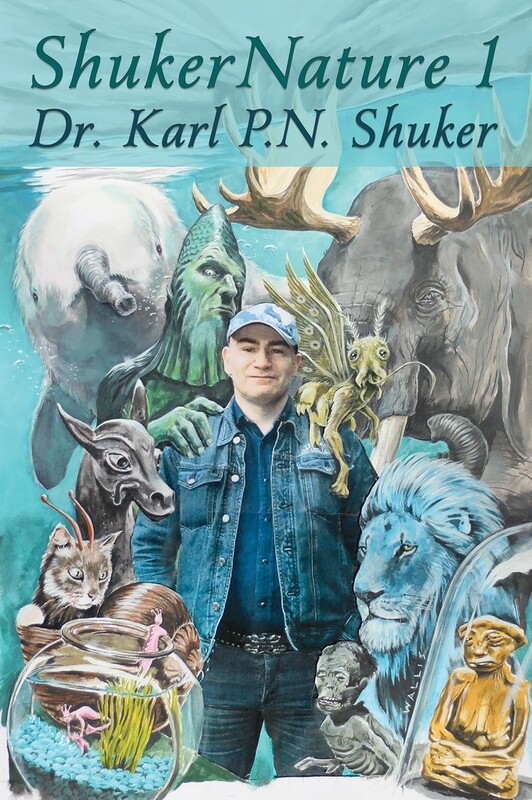 ShukerNature - Book 1: Antlered Elephants, Locust Dragons, and Other Cryptic Blog Beasts (Coachwhip Publications: Greenville, 2019); ISBN 978-1616464677. Pb, 418 pp, colour & b/w pix. More than 10 years and over 600 posted articles later, world-renowned cryptozoologist Dr Karl Shuker's long-running, perpetually popular internet blog ShukerNature makes its long-awaited debut in hard-copy form via the publication of this first book in what is planned to be a regular series that not only collects together but also presents in updated, expanded form whenever possible many of his most significant and unusual online articles. As ever, each and every one is packed with the painstaking scientific research and ever-present attention to detail on the most esoteric, hitherto-unpublicised aspects of cryptozoology, zoomythology, and animal anomalistics that constitute his trademark in these extremely diverse fields of investigation and documentation. Where else but on his ShukerNature blog – and now, exclusively, in this first ShukerNature book – could you encounter such exotic examples of (un)natural history as locust dragons and antlered elephants, North America's babyfeet and Linnaeus's fury worm, alligator men and crocodile boys, reptilian seals and seal dragons, king hares and giant rabbits, fan-tailed mermen and scaly bishops, flying cats, flying lemurs, and even flying elephants, blue lions and green tigers, giant oil-drinking spiders and bemusing sea-monkeys, ape-man Oliver, demonic dragonflies, marginalia snail-cats, lightbulb lizards, and how ShukerNature famously hit the cryptozoological headlines globally with a series of astonishing world-exclusives exposing the long-awaited truth about Trunko?